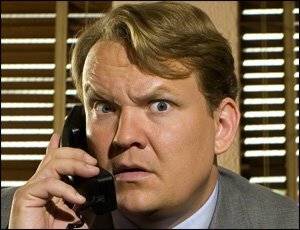 After a long separation, Andy Richter and Conan O’Brien will be joining forces again on the set of The Tonight Show, the one which Conan will be taking over for Jay Leno on June 1st. Richter will fill the role once held by Ed McMahon, serving as the announcer … According to a release sent out by NBC, Richter’s new role will not be as a sidekick, but he will be involved in live and prerecorded comedy bits. Hopefully this will work out well and harken back to the days when Andy was on Late Night and not be a battle of two “think they are” stars at 10pm. We’ll just have to wait, watch, and see. You are currently browsing the archives for the Tonight Show category.